What: Welsh power trio who put the emphasis on “power”, as well as big hooks, guitar heroics, and general rock. Why: Despite playing three shows in Toronto last year, most recently in November, this their first official tour in support of their second album, Wolf’s Law. But if the pattern holds, it certainly won’t be the last. Who else: Brookylnites Team Spirit and RIBS will support. How: Tickets for the show are $18.50 in advance but courtesy of , I’ve got one pair of passes to give away for the show. 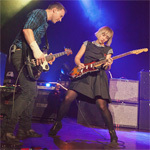 To enter, email me at contests AT chromewaves.net with “I want The Joy Formidable” in the subject line and your full name in the body and have that in to me before midnight, April 9. What else: The Milwaukee Journal-Sentinel, The Lantern, and Minneapolis Star-Tribune have interviews with the band.